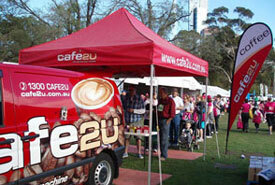 Cafe2U is Australia's largest and fastest growing mobile café franchise system. Established in 2000, Cafe2U has become known for serving award winning coffee, delicious cold drinks and a full café menu of hot and cold food. 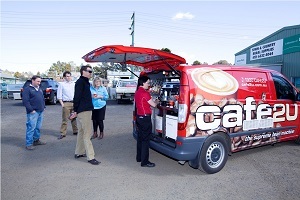 With more than 170 mobile cafés operating throughout Australia and New Zealand and more than 250 mobile cafés worldwide, Cafe2U continues to lead the market by delivering a premier café experience to workplaces and events everywhere! The key to the Cafe2U business model is simplicity. With no landlords, rent or staff, we have removed many of the stressful parts of participating in the hospitality industry. Cafe2U franchisees choose their own working hours with the business model focused on weekday success. Weekend event based work is entirely at the discretion of the individual franchisee. Each franchisee is allocated a support team member to assist you to achieve your business goals. 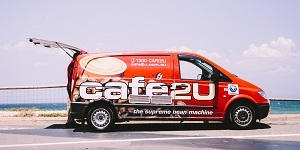 Franchisees are able to concentrate on getting to know their customers, safe in the knowledge that operational issues are handled by Cafe2U. There is extensive training at the Cafe2U Academy and your support member is always at hand to coach you. How much does a Cafe2U franchise cost? When you join Cafe2U all costs are included in one single price. The vehicle, equipment, franchise and training fees are all included - there are no hidden extras or fees and you own all the components. Cafe2U franchisees operate in their own exclusive territory. This means there is no competition amongst Cafe2U business owners who are able to operate as a team. Each territory is constructed using a combination of scientific modelling and proven business success. 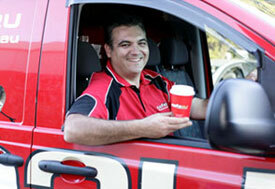 No experience is necessary to become a Cafe2U franchisee. We can train you on all aspects of the business model and provide ongoing support. If you would like to work your own hours and be your own boss then Cafe2U is the business for you!